Simple reference book for cooking with vegetables. The vegetable recipes are listed by origin (like "Beans from Asia"). There is an additional guide at the back with cooking guidelines for each vegetable, buying and storing, washing, ways of cutting, yields and equivalents, etc. This is not a vegetarian cookbook only, as it includes quite a few recipes with meat/veggie combos. The author plays a bit fast and loose with the "vegetable" classification, embracing corn and practicing a kind tolerance towards a layperson's understanding of what encompasses the word veggie. The recipes included in the book follow the KISS (Keep It Simple Stupid) method for the most part. While you can easily find jazzier recipes, the tried and true variations given (like Maple Glazed Roasted Sweet Potatoes) are great for a friendly reminder that good eating does not always require extreme measures on the part of the cook.One particular recipe is new to me and I will be sure to try it this summer, as we will be burdened with yellow peppers: Golden Pepper Ice Cream. Peppers are really fruits, as the author notes, so the combination should work fairly well. This is a big, heavy expensive book, but there's a lot of information about unusual veggies and a great general reference section about choosing, storing and cooking almost any vegetable. I also like that it's not a book for vegetarians. There are quite a few recipes that call for chicken broth and there's a general assumption that you'll be eating meat. It's been the cookbook I've looked to the most, since I love pretty much all vegetables. I love this book. It alphabetically lists every vegetable imaginable, explains what it is and how to prepare it. While some of the recipes are vegetarian, many are not - I often refer to this book when i am looking to incorporate my CSA bounty into our weekly meals. If you've ever been confused by the veggies you found in your farm share box or had an internal debate over whether or not to refrigerate kohlrabi, then get this book. It's an encyclopedia featuring all the information you'd ever want to know about a wide-range of vegetables, along with recipes for each entry. Not a great everyday cookbook. She advocates a lot of butter and my misguided selection of carrot soup left me with a grainy, pizza-tasting mess on my hands. BUT. In the back of the book, she has an encyclopedia of vegetables that has come in handy when thePenguin Companion to Foodoffers just a little too much information. Some of the recipes in here are fairly simple, but incredibly delicious. Several of the recipes have been great. My favorite so far is the jade soup (a spinach soup that left me deeply satisfied). But both the lamb hominy stew and the chile-corn souffle were big hits. This is fun, quirky book but I can't decide if I like it enough to want to keep it. There are certain sections which I find to be ordinary and not very interesting--the recipes can be found in many other cookbooks. Some parts are useful, especially where she includes microwave directions. A lot of foodies might scoff at her use of the microwave, but her inclusion shows her interest in the ordinary cook. We often only think of the microwave for heating food. It's true that the results can't match the usual cooking techniques, but it could be useful should a cook find oneself with just a microwave with which to make a meal. She's also forthcoming about where she gets her recipes, more than most other cookbook writers I've read. I loved this book. It made me want to have a garden so bad; so I could grow all these fabulous vegetables. Since I don't have a garden, I will be visiting the farmers markets all spring, summer and fall. Getting the freshest produce to make the sumptuous recipes that are in this book. Bon Appetite! 667pages of recipes and lots of vegetable history. I am not familiar with Kafka, but many of the recipes are common (hey, I want something different! ), so I copied 3 (Russian meat Borscht stood out) and returned it. Vegetable Love should be about vegetable, but a significant number of the recipes rely on meat, dairy, and wheat (gluten) ingredients and the veggie is a bonus. Decided to keep it anyway because I found some I'd like to try. Very thick book! Yeah, no, OF COURSE I did not finish this book! It's HUGE. I liked what I skimmed through, though. In particular, I enjoyed the author's friendly, conversational tone. Didn't get a chance to try any recipes before returning the book to the library, but perhaps in the future. I think I like the idea of this book more than I like this book. The encylopedia-style information in the second half is nice and useful. Sadly, I find a lot of the recipes underwhelming, although not across the board. Ultimately, I find it to be a good reference, but an uninspiring cookbook. This book is really hit or miss. The index focused on selection, storage, and cooking options is excellent. The recipes themselves are a gamble. Never, ever try the carrot ice cream. It's tasted like orange soap. But the broccoli puree is easy and fabulous. My go-to for anything veggie related. Her asparagus in the microwave method is just perfection every single time. Just picked this up...love it! Though it is obviously vegetable themed, it DOES have meat too. Expands the options, and you can't go wrong with Kafka at the helm. A good friend just recommended this book to me. She found it indispensable last summer as she chugged through recipes using up her CSA foodshares. I just picked this up at the library. It's a really great cookbook. I think I found my joy of reading cookbooks. Kafka is a wizard. A great reference. yummy recipies...soon to try...avacado ice cream...yum! Here are great tasting gourmet vegetable dishes. Not always the healthiest but I'm telling you TASTY! I love my veges. . .
Not all the recipes are vegetarian, but enough of them are to make this book interesting. I LOVE this book. Mucho thanks to Lisa S. for picking a copy up for me! xoxoxoxo Re-reading right now! This was a quirky book. I enjoyed the writing style. This book is huge, so I skimmed it. I didn't really find any recipes that jumped out of me. This book is awesome! 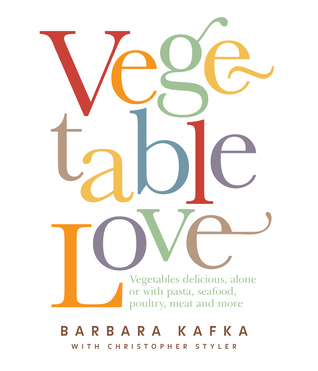 It's got so many great recipes ranging from easy to really complex and Kafka's love for vegetables is contagious! This is one of my favorite cook books right now!! I highly recommend it!